Gym With Child Care Newtown Square - Reasons to Join! It seems obvious that you should join a gym with child care for, well, the child care! Of course having a safe, active, and close-by environment for your child to play while you exercise is the primary advantage of attending a gym with child care, but there are other benefits that you might not have considered. After all, why even bother finding a gym with child care if you could just rely on your babysitter or other child care provider and get the same solo workout? Take into account these benefits you might not have thought of as you consider a gym with child care for your family. As a gym with child care services in the Newtown Square community, Ellis Athletic Center has seen the other benefits that this service provides, for both parents and children alike. In addition to being able to work out on your own and not have to worry about your children, here are the other benefits of attending a gym with child care. While we specialize in fitness at Ellis Athletic Center, we also have a knack for introducing families and helping children to make friends. When you join a gym with child care, you also join a gym of families who have children the same age as your own! This means that your kid can make friends and you can also find a community of parents with young children in Newtown Square. We have children who become friends in child care and then start to attend the same mini-sports camps at Ellis Athletic Center. Seeing familiar faces and having friends in the same activities can really encourage your children to remain active and healthy, even into their adult lives. At some gyms more geared toward adult fitness, you can get stiffer clients and staff members. Chances are, though, that gyms with child care also tend to have friendlier and more helpful staff and clients. At Ellis Athletic Center, we hire staff members specifically for our child care center who show friendliness, kindness, patience, and, of course, commitment to your child’s safety above all else. Kids brighten up a gym space as well, making certain spaces more light-hearted and less intense. 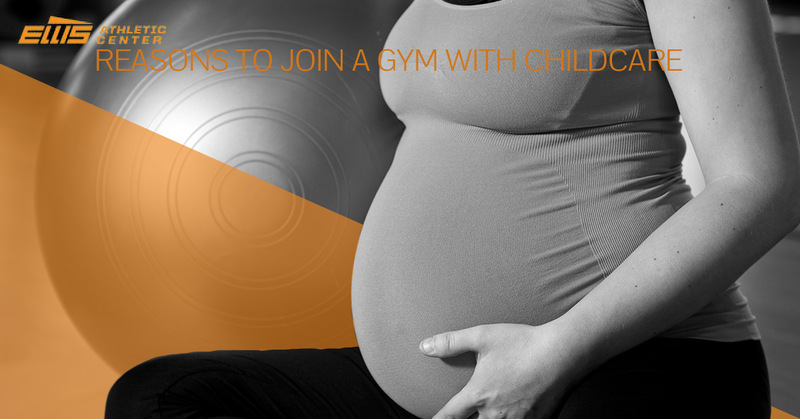 If you want a gym with an overall friendly and energetic atmosphere, definitely consider joining a gym with child care. We have found that families are way more likely to attend community events than younger, single individuals. This is because families are always looking for affordable activities that are also appropriate for all ages. When you attend a gym with child care, you also attend a gym that considers its families to be valuable members. As such, these fitness centers provide more family-centered events such as sports camps, family fitness days, and family-oriented facilities such as changing rooms and child-proof spaces. Check out our event calendar to see the family-friendly events occurring each week at Ellis Athletic Center. We have recurring events such as Mommy and Me Yoga classes and Kids Sports camps, and we also have special events such as our Community Wellness Weekend. When you take on the responsibility of having a child care center at your gym, you commit to safe facilities and procedures for the entire fitness center. Whether this means having a lifeguard on duty at all times, extra staff members available in case of emergency, or always-updated workout equipment, attending a gym with child care really contributes to overall safety. Additionally, certain machines and areas of the gym are only accessible to adults or children of a certain age with supervision, so you do not need to worry about children running around without proper supervision. Ellis Athletic Center prioritizes the safety of all of its clients, and this is especially the case when we welcome the youngest community members into our gym. Ellis Athletic Center isn’t just a gym with a child care center. Rather, we truly pride ourselves as being a family-friendly gym atmosphere that has opportunity for people of all ages. Join today and become a member of an amazing fitness community in Newtown Square that welcomes all members of the family.